Le Marais, 3rd arrondissement, Paris, France. On Rue Charlot. Ground floor on garden courtyard. Sleeps two to four. MINIMUM STAY: Generally 5 nights for advanced reservations for high season, and 3 nights for low season. However, we are open to any stay that fits well with the existing calendar. Just ask by SENDING EMAIL -- NOT by requesting to book!! THE BEST ROMANTIC HIDEAWAY IN THE MARAIS. That's our goal, and judging by over 150 FIVE STAR REVIEWS, we hope we have succeeded. What is more, from detailed instructions for arrival to reserving restaurants or taxis for you, we go out of our way to make your stay easy and trouble-free. FORMERLY A 17TH c. ARTISAN'S WORKSHOP! This beautiful completely renovated garden apartment is located in what was once an artisan's workshop in the days of Marie Antoinette. Located on the historic courtyard of a classic Parisian building in the Marais, it is among the oldest in Paris. The age of the building will be obvious when you first see the exposed posts and beams -- called 'colombage' -- in the courtyard itself, recalling the way all of Paris looked in the 17th century. LIKE A COUNTRY COTTAGE IN THE HEART OF PARIS. With its short pitch of tiled roof and its double French doors and French windows opening onto the garden, it's a one-of-a-kind, romantic oasis of calm in the Marais. The old world charm combines with modern amenities, a high quality bed, a luxurious bath, and a well-equipped kitchen to make an ideal Parisian retreat. AN EXCEPTIONALLY QUIET GARDEN APARTMENT, you will forget that the center of Paris is just outside, and feel as if you are in the countryside watching the birds out in the garden. The exceptional quiet means GOOD SLEEPING on the high quality bed that's been fit into a French antique, hand-crafted frame. Please read our visitors' comments -- many mention how quiet it is. RENOVATED BY A DESIGNER with international travelers in mind, the result is a successful amalgam of old world noble materials and modern style. The apartment consists of one big room that serves as bedroom and living area, a separate and fully equipped kitchen, and a full deluxe bath. In the main room and bath are beautiful exposed stone walls, and the original thick oak beams are exposed on the ceiling as well. In fact, the beams are older than the building -- there are signs that they were recycled when the building was built. DETAILS THAT MAKE THE DIFFERENCE. The floor has wide oak boards in the main room, with a welcoming antique killim rug, and antique stone tile in the kitchen and bath. Throughout there are clean lines and harmonious touches of color, giving a very aesthetically pleasing, peaceful ambience. WIFI -- AND LOW TECH, TOO. The high speed WiFi works flawlessly. Hidden away is a flat screen TV with more than 40 digital channels including CNN and BBC, and a DVD/CD/MP3 player with radio. There is an iPhone compatible alarm clock, a phone, and an answering machine. There is a whole library of Paris guidebooks. You will also find classical, jazz, and other CD's, many DVDs (including classic Paris movies), shelves full of interesting books, and reading lamps. A VERY WELL-EQUIPPED KITCHEN, AND MORE. The kitchen has lots of charm and modern appliances: a full-size oven, four burner stovetop, built-in refrigerator with freezer, microwave, toaster, hand mixer, and coffee maker. It is also well-equipped with all utensils for cooking and eating -- more than you will find in most rentals. The bath is beautifully done with deluxe modern fixtures, a large bathtub, a deluxe shower (it's superb! ), and both a washing machine and dryer tucked away in a closet. A hidden extra is a double-size hot water heater, so you should not run out. There is also a hair dryer, iron and ironing board, and vacuum cleaner. All linens, towels, and soap are supplied. AN EXCEPTIONAL NEIGHBORHOOD. Steps away on the corner, you will find the wonderful open air Marche des Enfants Rouge, the oldest market in Paris. Rue Bretagne has its own offering of excellent shops including butchers, bakers, traiteurs, wine, fruits and vegetables, and right on the corner one of the best fromagers (cheese shops) in the city. There are also two supermarkets conveniently nearby. The neighborhood is chock-full of antique shops, funky designers, and art galleries on the narrow streets. There are many great little restaurants and cafes with terraces, as well as charming Parisian parks. IN THE CENTER OF PARIS. The Picasso Museum is literally just around the corner, as is all the rest that the Marais has to offer, from the magnificent Hotels Particuliers (17th century city mansions), many housing museums, to the famous Place des Vosges. You can easily walk to Hotel de Ville in about 15 minutes, and then Notre Dame and the other major sites along the Seine. The Pompidou Center is also right close by. There are several Metro stations nearby, and bus lines that run through the Marais. SAFE AND SECURE. The apartment is very secure: To get in the building requires both a code to get in the main door and then a key to get through an iron security gate. The door of the apartment itself has a high security lock. The windows have security blinds that close tightly over them if you want to leave for any length of time, and the windows themselves also have locks. In short, there are more security features than you need! Especially for this lovely, safe and quiet upscale neighborhood. WE DO EVERYTHING WE CAN TO MAKE YOUR VISIT A PLEASURE! We will answer whatever questions you have before you arrive, and provide detailed instructions for getting to the apartment. The day you arrive, someone will meet you, help with your luggage, and show you into the apartment. We accommodate early arrivals and late departures. We also routinely organize taxis for the day of departure -- they come right to the door to pick you up. In the apartment, you will find loads of guidebooks, other information on Paris, and a binder full of detailed information on the apartment, the neighborhood, and more -- where the best bakery is, nearby restaurants we recommend, how to get a taxi, where to park, and so on. We are happy to help make reservations for you. If you have any problems in Paris, we'll try to help. Our goal is to help you live in the neighborhood like a local French person -- an experience you would never have in a hotel -- while minimizing hassles and maximizing your enjoyment. IMPORTANT CONTACT INFORMATION: The best way to contact us initially is by email. We will respond as quickly as possible, usually within 24 hours. If you do not receive a reply, please call us as there may have been a problem with the reception of the email. IMPORTANT NOTE: We have OVER 150 REVIEWS, all positive! After the HomeAway takeover, VRBO erased a large number of our reviews and they refuse to put any back that are more than one year old. We've been renting our apartment for longer than most others in Paris and feel their policy is misleading and unfair. If you'd like to see the other reviews, just let us know. Joelle is French, and a professor of French literature. Chris is American, but has spent most of his adult life here in France. We like to make this apartment available to travelers, like ourselves, who wish to immerse themselves in the local culture and would not have it be changed to suit them. And we want to make it the way we'd like to find an apartment in another city -- beautiful, clean, with a very good bed, and outfitted with everything one might need. Voila! This will be our 'pied-a-terre' when we move from Paris. It is a wonderful little island of calm in the center of the city -- and our favorite neighborhood. We love the old world stone and beams -- the way a Paris apartment should be -- and the garden outside the windows makes you feel as though you could be in the countryside. Having the center of Paris at your doorstep! And the Marais and our neighborhood, in particular. It is like a little village in the heart of Paris. Plus, the apartment is truly quiet -- a haven of peace in the middle of the big city. A full bath with a generous full-sized bathtub, and a large deluxe shower fixture. A normal size clothes washing machine and a separate dryer are in a closet. A stack of thick towels, bath mats, and a full sized bar of quality soap are provided. Laundry soap and toilet paper are also provided. In the very center of Paris, in the nicest part of the Marais -- close to everything and yet not overrun with tourists. Cordless phone with answering machine. Free calls to Paris and France. Free long distance, too! See details. Several quality electric heaters that you control. You can make it as cosy as you'd like. 100% cotton linens, blankets, and towels, as well as two down comforters (one lightweight, one heavier weight). There is now also a synthetic comforter and good quality synthetic pillows. A full sized machine, in the unit for your exclusive use. We will provide you with detailed information on parking options. High speed. No connection limits. A stack of thick cotton towels are provided. They are normal bath size. There are also small hand towels, and kitchen towels. High speed WIFI, easy to set up for either PC or Mac. Works well with iPhones and iPads. New, modern full-sized, four burners. New, modern full-sized. Quite a nice oven; very easy to use! New, very easy to use. There are three: An electric drip machine, a stainless French press pot, and an Italian stovetop espresso maker. The pantry is 'revolving' -- we add things, and visitors leave many staples. As a result, there is usually a good stock of things for you to use. Small and large plates, bowls, glasses, wine glasses, and utensils for 4-6 people. There are other items as well, such as coffee mugs, champagne glasses, a teapot and tea kettle, and so on. Refrigerator with freezer, full-sized built-in oven, modern 4 burner stovetop, large sink, microwave oven, toaster, electric and Italian coffee makers, and a French press pot. The dining table is an antique wooden table such as were found in Paris bistros in the past. It is of ingenuous Italian design, with extensions that pull out. 2 wooden chairs, and 2 folding chairs. Modern flat screen, hidden away in a cabinet. More than 40 digital channels, including CNN and BCC. A good unit, with good sound. You can plug in your device. There is a whole library of Paris guidebooks. There are several shelves full of good vacation reads, for all tastes. There is always a varied stack of good magazines as well. Jazz and classical CDs, and several others as well. A tall stack of DVDs, including a growing collection of films that take place in Paris. We do not have bicycles available, but we will let you know how to rent them, and also provide details for exceptional bike rides just outside of Paris. There are many communal pools available in central Paris. Contact us if you'd like to use them. 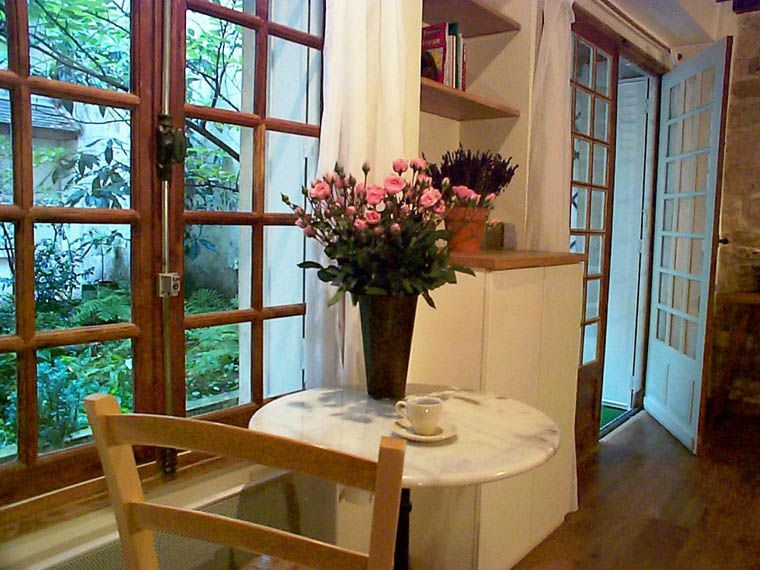 A wonderful cottage that has everything you need to relax and enjoy Paris. The location can’t be beat - the market, cafe’s, restaurants - are just a short walk away. The Marais neighborhood is great for daily strolls, shopping, and dining. We looked forward to arriving home to this comfortable, homey cottage after long days of touring all that Paris offers visitors. As importantly, Chris was very responsive and helpful from the moment we secured our reservation through our departure. I'm glad that you had a good stay. Thanks for mentioning the neighborhood -- we think it's the best in the city! Fantastic, the place has everything you need. This is the most cleverly designed studio I have every stayed in and the most quiet, couldn't hear a thing. Thanks for such a great stay in Paris! After visiting Paris regularly for the past 27 years I have finally found the perfect apartment. Nestled in the heart of the Marais it is the perfect location from which to visit the glorious sights of Paris. Right next door to the Marché des Enfants Rouges, the oldest covered market in Paris, you have a plethora of cafes, bars and restaurants on your doorstep. From here it is a short walk to the river Seine which in one direction takes you to Notre-Dame Cathedral and the other to the Louvre. You can cross the river to visit Île Saint-Louis or the area of Saint-Germain-des-Prés. The apartment is also close to several métro stations which can take you further afield. The apartment itself is beautiful and looks onto a little courtyard with a rose garden. It is very well equipped and incredibly quiet which is remarkable as you are in the heart of the city. However, I must say that the best thing about my recent visit was the kindness of the hospitable owner Chris. Before we had even arrived he provided some fabulous suggestions of places to visit during our stay as well as making bookings at restaurants for us. His recommendations were spot on and really made our visit a most memorable one. I cannot thank him enough and will definitely be returning to this gem of a find in the Marais.....! An ideal base to explore Paris from, compact but with everything you need. We walked to the Louvre. In a great area with all the facilities you need nearby. We ended up walking to and from the Tuileries Gardens although Rambuteau Metro is handy. Loved our time there and hope to return soon. It's true! You can walk to many of the sites in the city. 5 min -- Picasso Museum, other museums in the Marais. 10 min -- Place des Vosges, Bastille, Pompidou. 15 min -- Hotel de Ville, Les Halles. 20 min -- Notre Dame, Ile St Louis, Saint Chapelle. A half hour walk -- Louvre, Palais Royal, Tuilleries, Pont des Arts, Luxembourg Gardens, Pantheon, Jardin des Plantes, and more. I love rue Charlot, one of my favorite areas in Paris--close to everything, and just off rue de Bretagne with amazing shops, cafes and close to the Picasso Museum and Georges Pompidou Museum. This apartment is wonderful--every detail has been considered--very clean, comfortable and cozy. Both the kitchen and bathroom are very up to date and extremely clean and well maintained. My stay was in January, so I did not enjoy the outside area, although it must be lovely in the spring and summer. Chris is very thoughtful--he provides detailed information about every aspect of the use of his property. He also responded to all of my questions via email in a timely manner. He is available via mobile phone for questions (although I did not need to call him--he has a full binder with the answer to every possible question one could have.) The apartment is safe and secure--I was traveling alone and my family was concerned about security--Chris answered all my questions about this in detail. There is an outside door with a security code, then an inside iron gate with a key, then double deadbolts on the apartment door. I felt very safe and happy. It was peaceful and quiet--the neighbors are extremely courteous and quiet. The neighborhood is safe--I had dinner out several evenings and walked home alone without any concerns. I have rented many apartments in Paris over many years and this is by far one of my favorites. Exceptional--And a great value!!! Thank you, Chris!! Thanks for mentioning how safe the apartment and the neighborhood are as photos can't show it. I'm glad that you had a great stay. After a work related international trip, my wife and I met in Paris. This being our first visit, we did a significant amount of research and asked friends about where to stay and what to do. Marsai was the hands down consensus from everyone. The advice did not disappoint us. After finding Chris's place and learning it was available during our planned visit, we took a chance. I had never seen a 5.0 star rating before and thought the place looked perfect. Well - it was. First off, the location is awesome. The open air market right around the corner was totally cool and a place we enjoyed very much. The 'Country Cottage' felt extremely safe and secure. The cottage itself is small, but for two people gave us plenty of room. The space is incredibly creative with a closet and place for clothes, an awesome little kitchen and a bathroom with a tub for two. We took advantage of it all. The checkin was easy and contacting Chris immediately upon arrival helped us feel comfortable right off the bat. I highly recommend this for any couple interested in a romantic visit to Paris. Thanks Chris! Minimum number of nights varies by season and circumstances. For high season, usually 5 nights is required, but at any time of the year short stays can be possible if they fill holes or otherwise fit well with the calendar. It's best to send a request and we will let you know. Since we have visitors from all over the world using different payment methods, we ask that everyone pay whatever fees are associated with getting payment to us. We feel this is the most fair since fees vary widely, from zero for Europeans to quite high for those who insist on using old fashioned wires. Alternatively, we could raise our rates to cover the average fees, but this would not be fair to those who do not have to pay them. For many, currently PayPal is the most rapid and reasonable in terms of fees, and therefore our default choice. If you have a better method, just let us know!